In June 7-17, 2016, the TRA revisited TR’s journey with a 21st Century twist. 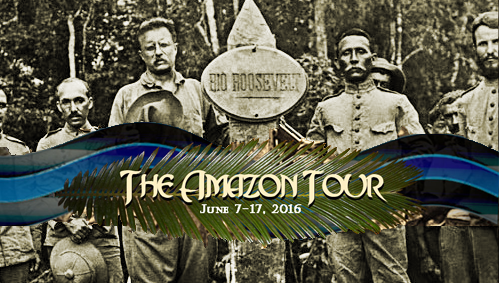 The tour retraced Theodore Roosevelt's visit to Rio de Janeiro and the Amazon to gain a real understanding of his greatest and most harrowing adventure, officially the Roosevelt–Rondon Scientific Expedition, but better known today as TR’s River of Doubt journey. From October 1913 to May 1914, following a lecture tour through South America, TR and a group of American and Brazilian naturalists, explorers, and hardy rivermen set off into the jungle to survey the River of Doubt, a tributary of the Amazon that had been discovered only a few years earlier. The expedition was fraught with danger and nearly cost TR his life. Though weakened and forever changed, TR survived this last great adventure of his life, commemorating the journey in lectures and in the best-selling book, Through the Brazilian Wilderness.